On a sunny 17th of July, we gathered to celebrate the graduation of CRIPES members Dr Ellie Sherrard-Smith (Doctor of Philosophy), Mike Reynolds, Cormac Kinsella and Willow Smallbone (BSc in Zoology with 1st Class honours). 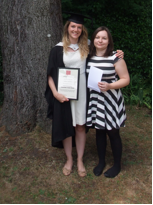 Willow Smallbone was also the Professional Training Year Prize for her work on Toxoplasma gondii. On the same day, Jo James was awarded the Worshipful Livery Company of Wales Travel Scholarship that will take her off to Prague this Autumn to work on crayfish plague.